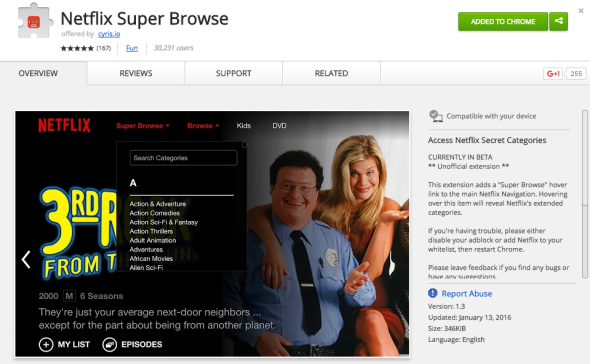 Netflix Super Browse makes finding secret categories easier in Chrome and Firefox. Genre is a slippery thing, its categories frequently incoherent, its boundaries often unstable. No company knows that better than Netflix, which, as Alexis Madrigal revealed in 2014, categorizes its collection via a complex set of interconnected microgenres. These so-called secret categories, of which there are more than 75,000, allow for surprisingly precise classifications—Madrigal came across “Evil Kid Horror Movies” and “Time Travel Movies Staring William Hartnell,” for example. Actually employing those categories in your own browsing can be frustratingly clumsy, however, requiring users to crawl through plain-text lists and fiddle with URLs. Fortunately, things just got a lot easier. This week, Reddit user CyrisXD released a Chrome extension and Firefox addon called Netflix Super Browse that incorporates a significant fraction of these categories directly into user experience on the site. Super Browse is pleasantly seamless, simply adding a new drop down list to Netflix’s menu bar next to the existing “Browse” tab. (Note that Super Browse doesn’t play well with ad blockers. You may have to turn yours off, and possibly clear your browser cache, to get it to work.) While it’s not as comprehensive as the list Madrigal developed, Super Browse still encourages users to get far more granular far more easily than they’ve been able to in the past. It includes labels such as “Deep Sea Horror Movies,” “Southeast Asian Movies,” “Independent Action & Adventure,” and much more. Many of these subgenres were already accessible on Netflix through a list of genre categories, attached to each film or series’ page. It groups the acclaimed Tangerine, for example, with “comedies,” “late night comedies,” and “dramas,” while also describing it as both “gritty” and “raunchy.” Click on any of those terms and you’ll get a list of similarly labeled streaming options. Many of these classification schemes end up spitting out information similar to that offered by Super Browse and other tools. Nevertheless, exploring the categories this way is tedious and inefficient, since you can only identify a possible category in the first place by examining other films. Given how easy it apparently is to improve on this approach, one might reasonably ask why Netflix hasn’t implemented a similar utility itself. As I’ve argued before, Netflix has long been invested in propagating the illusion of human choice, even as it steers us toward the same old garbage. One Reddit user offered a sly suggestion along these lines, proposing that the current browsing system serves to keep the site’s users from realizing how small the site’s total collection actually is. Whether or not that’s true, many of the microgenres really are quite small: Check in with those deep-sea horror movies, for example, and you’ll find just six titles—all of them low-budget, most of them involving sharks and/or unusual weather patterns. For his part, Super Browse’s creator—who invited us to mention that he’s available on Twitter—told me that he thinks “the current Netflix system isn’t the best” and suggested that it’s designed “to give the illusion that their content is endless.” Under ordinary circumstances, he wrote in an email, it rarely offers him anything truly novel. He decided to develop the extension after trying out a few of the hidden categories and realizing that they were actually showing him movies that he hadn’t seen yet. Ironically, however, he says that he’s been so busy working on the extension that he hasn’t had a chance to actually use it much himself yet. Let’s hope he gets a chance soon.